ARRIVE EARLY – We recommend arriving at the airport two hours prior to the departure time of your flight, especially during early morning flights. This will give you the opportunity to check in early, get through the passenger screening process, and locate your departure gate without worrying about missing the flight. Some users assume that because the Rogue Valley International – Medford Airport is not a large hub, there won’t be any hindrances to catch a flight at the last minute. Unfortunately, you never know when an issue could arise causing an unexpected delay, such as a ticket kiosk being down, a family of six arranging seat assignments with the ticket agent, or someone who’s over packed their bag and is repacking in line. CHECKING IN FOR A FLIGHT – You are required to have a valid government issued ID when you check in. Be prepared to show this ID at each stage of your trip. Types of government issued ID include: a valid drivers’ license, military ID card, passport, or Social Security Card accompanied by a government issued photo ID. Please also check with your individual airline to determine their specific check-in deadline. If you are traveling with an E-ticket or ticketless, confirm with your airline what you will need at check in. MEETERS AND GREETERS – Access to the Rogue Valley International-Medford Airport is easy. Please be aware that if you choose to drop off or pick up passengers curbside, the driver must remain with the vehicle, and passengers must be actively loading or unloading. Extended parking will not be permitted. The airport now has cell phone lanes to assist you when picking up your party. When making arrangements to pick up a passenger, let them know you will be waiting in the cell phone lane. Once your party has deplaned and retrieved their luggage, have them call you and the pickup time at the curb will be substantially less, reducing vehicle congestion. 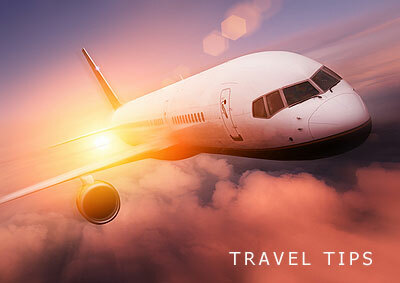 We hope this list of tips helps you better plan and enjoy your next trip. If you would like a more detailed description of prohibited or permitted items go to www.tsa.gov.